The 30--60 CBM Aluminum Alloy Cooking Oil Tank Trailer is designed for the transportation of food grade materials such as cooking oils and similar products. 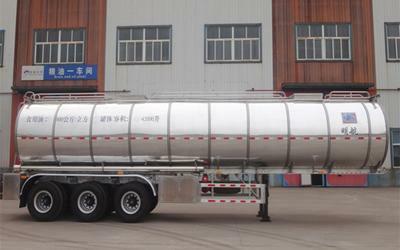 The aluminum alloy cooking oil tank trailer offers advantages over ordinary steel tankers due to its lightweight materials and construction. The aluminum trailer is 4 to 6 tons lighter than ordinary tank trailers. The anti-static nature of aluminum alloy prevents sparks, which can create hazardous incidents in some cases. The tanker is lightweight, environmentally friendly, and can haul large loads. Sanxing has been manufacturing heavy duty vehicles and special vehicles since 1994. Besides the aluminum alloy cooking oil tank trailer, we offer a wide range of edible oil tank trailer, stainless steel oil tank trailer, flatbed trailer, cargo semi-trailer and so on. From the raw material selection to manufacturing process, we have rich experience and offer high quality aluminum alloy tank semi-trailers and other special transport vehicles with custom solutions.